Tag line: "Sometimes you need a little help finding yourself"
Before Adrien Brody turned in his Academy Award-winning performance in Roman Polanski’s The Pianist, he explored a different kind of character altogether in 2002’s Dummy. 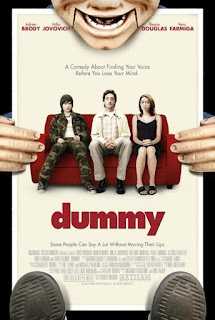 Written and directed by Greg Pritikin, Dummy is a harmless, entertaining film about a man who deals with his anxieties in a most unusual way. Steven (Brody) lacks confidence. His parents barely acknowledge his existence, and his older sister, Heidi (Ileana Douglas), insults him every chance she gets. When Steven’s fired from his dead-end job, he takes advantage of this new-found freedom to follow his childhood dream of becoming a ventriloquist. His best friend, Fangora (Milla Jovovich), the lead singer of a punk rock band, is supportive, and Lorena (Vera Farmiga), the pretty girl who works at the employment agency, even helps Steven find an agent to represent him. While mastering the art of ventriloquism, Steven gradually discovers the self-assurance he never knew he had, even going so far as to ask Lorena out on a date. Did Steven initiate this amazing transformation on his own, or does he owe it all to his dummy? 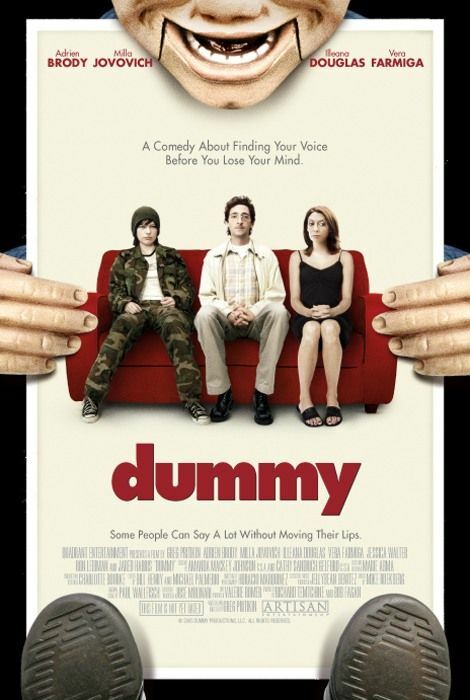 In Dummy, Brody effectively portrays a man suffering from very low self-esteem, one who expresses himself almost exclusively through the mouth of a ventriloquist’s best friend. The fact that Brody performed his own ventriloquism and puppetry in Dummy is no small feat, but it’s the passivity he brings to the role, and how he slowly sheds it as the story progresses, that’s truly impressive. The evolution of Steven from self-conscious loser to assertive ventriloquist occurs quite subtly; so subtly that it’ll hardly show up on your radar. Even by the end of the movie, Steven remains a bit awkward, yet there’s a slight difference in his demeanor. While not the smoothest of lovers, he grows more at-ease whenever Lorena is around, the nervousness he displayed early on gently dwindling over time. His emotional growth is methodical, and Brody successfully conveys Steven’s maturation without ever losing sight of the character’s basic insecurities. Highly overlooked and under-appreciated film this one, Brody is terrific and Milla Jovovich is outstanding! And the always great Illeana Douglas.